My Mom's Best: Listen Giveaway! Being mommy of two boys, I am busy with doing things I love. 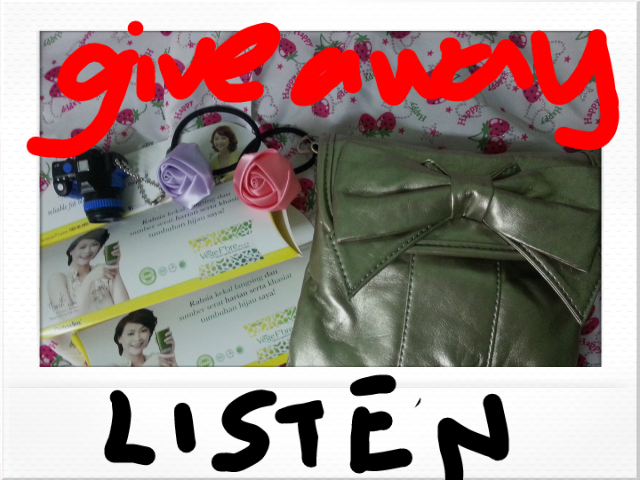 Now there's Listen Giveaway on this blog, you can join too. It is easy to take part, just see below for detail. Now listen I have got wonderful things to giveaway and lovely sponsor Crystalsparadize who made the roses hairband. Now listen on how you can take part in this giveaway. 2. Two Roses handmade with love hairband from Cystalsparadize. 3. Two sachets of NH Vege F'bre Plus from Shopping, you can read the review here. To take part in this Listen Giveaway, listen this is what you need to do. LISTEN DO ALL BELOW. 1. Be GFC follower of My Mom's Best, crystalsparadize, Shopping, WhatEveryGalWant. Crystalsparadize is awesome blogger, she's new mom to baby girl and she has many handmade with love fashion and hair accessories for sale. Take a look at her blog posts and you will love them. 2. Add the blogs My Mom's Best, crystalsparadize, Shopping, WhatEveryGalWant to your blog list. 3. Your blog must be 1 YEAR OLD to be fair with other bloggers. Blog this giveaway on your blog with the banner above and Prizes and link to this post! TITLE POST: LISTEN GIVEAWAY! 4. Add above banner to your blog side bar. 5. If you have more than a blog you can make another blog post giveaway on your blog, this give you extra entry for giveaway. 6. Giveaway start from 1 March 2013 until 31 March 2013 at 12 midnight, Malaysia. Giveaway open to blogger with address in Malaysia for postage of Prize.